GPS Watch with U.S & Canada Topo Mapping! The Garmin Tactix Charlie is a wrist-worn powerhouse built for the avid outdoor adventurer. 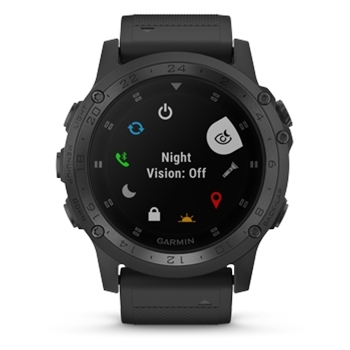 A GPS watch built with routable TOPO mapping, wrist based heart rate monitoring, and tactical features, are just some of the key things that make this device a must have. From the office to the field, the Tactix Charlie offers a rugged yet sleek design and includes a black diamond-like carbon coated titanium bezel and stainless steel buttons. A full colored Chroma Display with a user activated night vision mode will reduce backlight settings so your Tactix Charlie won’t interfere with the operation of night vision goggles. 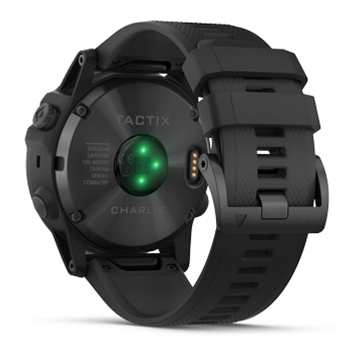 Whether you are going out for your daily jog, or you’re headed out into the training field, the Tactix Charlie’s built-in mapping will give you peace of mind and keep you on course. Detailed TOPO mapping will provide you with contours, elevations, and all of the detail needed to enjoy life off the beaten path. While navigating, there are three key tools used to provide you with the most accurate location readings such as a three-axis compass, barometer, and gyroscope. 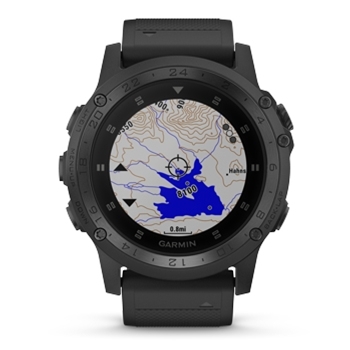 The built-in altimeter will provide you with elevation data to monitor ascent and descent while you’re hiking and works together with the three-axis compass to keep your bearing whether you’re in motion or standing still. At a glance guidance is an excellent feature that will show banners on the Tactix face to show upcoming turns in your navigation path. Elevate wrist based heart rate offers 24/7 monitoring with no extra chest strap required, a great feature when training or excelling in other activities. In addition to monitoring your heart rate, the Tactix Charlie counts daily steps taken, monitors sleeping patterns, and shows calories burned. Tactical-specific features such as Jumpmaster, waypoint projection, dual-position GPS formatting, along with preloaded tactical activities offer all critical information needed to critique your days of training and will show how your skill levels are changing. When your Tactix is paired with a compatible smartphone, you will receive emails, texts, and see who’s calling you right on your watch face keeping you informed, every step of the way. The built-in battery can last up to 12 days in a smartwatch mode, up to 20 hours while in GPS mode, and up to 35 hours in an UltraTrac battery saver mode, ensuring that you won’t have to worry about the battery power, every time you put your Tactix to use. For the ultimate tactical, wrist worn GPS, the Garmin Tactix Charlie is your multi-sport solution. GroupTrack and Live Track features allow you to keep tabs on your friends and also allows them to follow you in real time! The Garmin Footpod for Fenix, Forerunner and FR fitness watches will calculate speed and distance and wirelessly send that data to your wearable GPS.